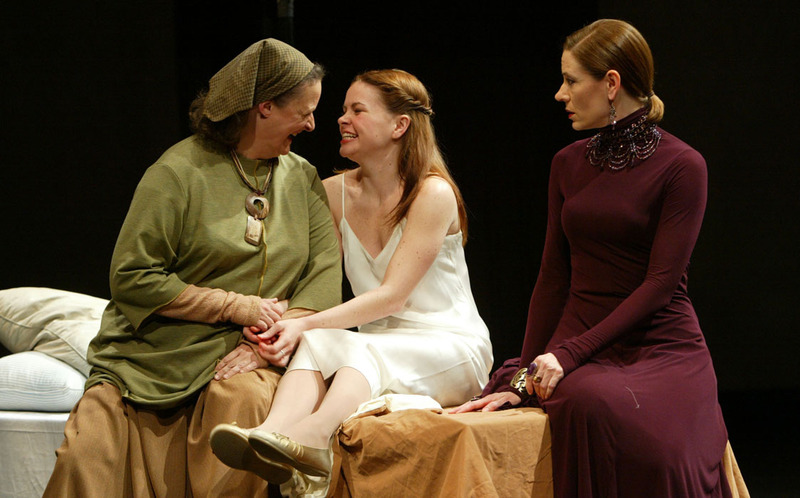 Nancy Robinette (Nurse), Nicole Lowrance (Juliet), and Julie-Ann Elliott (Lady Capulet), Romeo and Juliet, directed by PJ Paparelli, Folger Theatre, 2005. How does Shakespeare portray girls and girlhood in his plays, and what do those portrayals tell us about life in Elizabethan and Jacobean England? Our guest for this Shakespeare Unlimited episode, Deanne Williams of York University in Toronto, is the author of Shakespeare and the Performance of Girlhood, published in 2014. She is interviewed by Neva Grant. From the Shakespeare Unlimited podcast series. Published November 1, 2016. © Folger Shakespeare Library. All rights reserved. This podcast episode, “Why, Here's a Girl!” was produced by Richard Paul. Garland Scott is the associate producer. It was edited by Gail Kern Paster and Esther Ferington. Esther French is the web producer. We had technical help from the News Operations Staff at NPR in Washington, DC. Since the early 1990s, the academic genre known as girlhood studies has explored the world of female preadolescence, using the methods of sociology and anthropology, as well as literary and cultural studies. During its first decade, girlhood studies looked primarily at contemporary issues and trends, but since the early 2000s, the field has begun to look back into the past. 2014 saw one of the first books published looking at early modern girlhood. Perhaps because it was written by a Shakespeare scholar, Deanne Williams of York University in Toronto, the book focuses on how Shakespeare portrayed girls and girlhood in his plays and what those portrayals tell us about life in Elizabethan and Jacobean England. The book is called Shakespeare and the Performance of Girlhood, and Deanne came to Washington recently to discuss it with us. We call this podcast, “Why, Here's a Girl!” Deanne is interviewed by Neva Grant. NEVA GRANT: At the time Shakespeare was writing, the very word “girl” was dynamic, wasn’t it? It was a fluid word. GRANT: And did that reflect, at least as far as the Middle Ages were concerned, did that reflect how actual boys and girls were thought of, which is sort of just smaller versions of adults, and their gender was, sort of, irrelevant? WILLIAMS: Yes, absolutely, it reflects a certain idea of gender indeterminacy in childhood. These days we’re so careful to establish that with blue for boys and pink for girls, and it’s always, “It’s a boy,” or “It’s a girl,” when a child is born. But in the Middle Ages and in the early modern period, there was less of a sense of childhood being firmly fixed to one gender or another. Children were raised together. They wore very much the same clothes. In fact, a lot of linguistic historians and philologists think that the word “girl” came from the Old English word gyrela, which means a garment or a skirt. So, that refers to a process of gender differentiation that would happen around the age of seven when boys were breeched and were wearing trousers, and girls were continuing to wear the skirts or the kirtles that younger children both wore. GRANT: So, again, up until the point that boys were breeched, they both wore these sort of formless, skirt-like, I don’t know, apparel, you know, that where, if you just saw them in the streets, maybe they would even be indistinguishable. WILLIAMS: Exactly, there’s that idea of the indistinguishability of the gender in childhood. GRANT: So, but at the time that Shakespeare is writing in the 1600s, something happens to the word “girl” that starts taking on the identity that we have for it today. WILLIAMS: Yes, absolutely. There were a lot of different options that were available, there are a lot of different words in the 16th century that you could choose from to talk about young women. For example, the word “wench” is an option. That word “wench,” we think of today as associated with service, right? GRANT: And so, as you’ve just suggested, the words take on very different meaning with respect to chastity and modesty, and waywardness, right? But there, too, there was some fluidity. Depending on how it was used, or who used it, the very word “girl” could mean someone who was modest or someone who was not so modest, the same with “wench” or “maiden” perhaps. WILLIAMS: Right, absolutely. The word “girl” brings with it a whole bunch of different associations, many of them quite competing and contradictory. So, on the one hand, “girl” could be tied to the idea of a “wench,” tied to service, other equivalents for the word “girl” in early modern dictionaries are “punk,” “harlot,” “troll.” So, “girl” has these associations with not only domestic, but also sexual, kinds of service. But at the same time as Shakespeare’s using it, “girl” also tends to bring with it notions of virginity and chastity and innocence, that childhood kind of innocence. So, we get these different competing notions of girlhood in Shakespeare; where, on the one, you’re pulled in the direction of virginity, of maidenhood, and on the other hand, you are... there are associations with sexuality. WILLIAMS: Exactly, we see that very much today with the way in which girlhood is policed, notions of what is appropriate girl’s clothing is a very charged issue in high school. We have a show like Lena Dunham’s wonderful series Girls, which is so concerned about that kind of cusp period between adulthood and childhood. So, “the girl” is very charged for us today and it was charged in Shakespeare’s time as well. GRANT: Yeah, it’s so fascinating. There was a term that was used in some plays during Shakespeare’s time, and it’s a term we still use today: “good girl.” Tell me about that and what kind of resonance it had. WILLIAMS: Shakespeare certainly does have “good girls” in his plays. One example would be Bianca in The Taming of the Shrew. Bianca is described as a “young modest girl.” And so, there definitely are those associations with innocence, also with victimhood: Lavinia in Titus Andronicus is called “a girl who should not survive her shame,” and [the fact that] she’s murdered by her father at the end of the play, reflects this idea of her victimhood, the idea that she’s been sexually victimized and therefore she cannot outlive this shame that has been placed upon her. GRANT: Right. And it also seems that for Shakespeare there would’ve been a line that you would cross, if not in age, then at least in temperament, in respect to what separated a girl from a woman. For example, I think we all know that Olivia in Twelfth Night is not a girl, Viola is. Hermione and Helena in A Midsummer Night’s Dream, are they girls, are they...? I mean, you know, is there a line? Do we look for how the character acts to tell us whether she’s a girl, a young girl, a woman, or something else? WILLIAMS: Yeah, absolutely. There’s also the distinction between a “child” and a “girl,” a young child and a girl. So, in Romeo and Juliet, the Nurse asks us to imagine Juliet as a child, as a toddler, falling on her back. And then when she has a mind of her own and wants to choose her own husband, she becomes a girl, this word “girl,” that all of a sudden becomes associated with a sort of challenge to patriarchal authority. We also see that in The Tempest, when Prospero imagines his little girl Miranda as a child, as a cherubim, when she was three, when they were on the boat together, fleeing across the Mediterranean. And when she falls in love with Ferdinand, all of a sudden she becomes a girl. So, the word “girl” brings with it a certain kind of danger, a certain kind of heedlessness to patriarchal authority. GRANT: I’m glad you mentioned Juliet from Romeo and Juliet, because she’s one of the girls in Shakespeare that I wanted to concentrate on. Fascinating character, because on a first read, or if you remember your high school experience of Romeo and Juliet, you forget what a powerful character she is. WILLIAMS: Absolutely. When I was writing this book I was astonished, really, how different the Juliet appeared that before me, and how that... I sort of was surprised because it was so different from my own recollection of Juliet as this kind of twee figure, simpering, sort of tiptoeing across the stage. I had these ideas of Juliet, sort of a cultural memory of Juliet, which was very different from what I encountered on Shakespeare’s pages. And there’s a way in which she too is very early on distinguished from a kind of childhood innocence, when her father is relieved when he thinks she has agreed to marry Paris and to obey his wishes. He says his heart is... “My heart is wondrous light / Since this wayward girl is so reclaimed.” So, her waywardness, her resistance to the authority of the plan to marry Paris, represented by her love for Romeo, is understood as a kind of waywardness, a kind of resistance. So we see that in Juliet, all the way through we see that she is someone who consistently resists the models that have been provided for her, for how a girl is supposed to act. GRANT: I mean, she manipulates Romeo a little bit, doesn’t she? WILLIAMS: She manipulates, she guides, she organizes, she understands that she is expected to behave a certain way, there are cultural expectations for her modesty, and she resists them. She worries that she has given her heart to him too quickly, and she says that she will in fact go back and replay that script again if he wants her to, “frown and be perverse and say thee nay.” She will, you know, once again perform the resistance to his overtures that is supposed to, you know, reflect this idea of modesty. GRANT: Let’s talk about another one of Shakespeare’s very well-known girls, or young women: Ophelia from Hamlet. Tell us about her, and also tell us how she can be interpreted differently depending on which text of the play we’re actually reading. WILLIAMS: Right, well, Ophelia is very different, she appears very different, in the First Quarto, or Q1, version of Shakespeare’s Hamlet, which was published in 1603. Hamlet comes to us in three different texts: the First Quarto, this one; the Second Quarto, 1604; and then the later First Folio, which is 1623. And in the Q1, or First Quarto, version of Hamlet, which was the first published, but also scholars think it is an edited version of an original text which is reflected in the Q2, which is published, actually, later. So, this revised version, in the Q1, of Ophelia presents a very different take on Ophelia than what we’re used to, again, in our sort of cultural memory of that character. We imagine Ophelia as a victim of circumstance, rejected by Hamlet, bereaved by the death of her father Polonius, and unhinged by this grief. What we have in the Q1 Ophelia instead is a character who’s much more of a cool customer. And the main difference, one major difference, between these two different versions of Ophelia that we get, is that in the Q1 Hamlet, Ophelia is carrying a lute. And so her entire mad scene, where she’s singing these songs, which in the other versions of Hamlet that are more familiar she’s singing snippets here and snippets there, and it’s all this kind of jumble and mess, in the Q1 Hamlet it’s in fact a very coherent playlist that she performs, accompanying herself on the lute. GRANT: And the lute is sort of the steadying device in this version? WILLIAMS: It anchors her, yes. GRANT: So, a lute was associated with sort of being, I guess, together in a way, or being calm and collected. WILLIAMS: Right, absolutely. So, the lute symbolizes a lot of the expectations that were placed on girlhood in the early modern period. You have its curvy shape, its quiet gentle notes. King Lear talks about the voice of Cordelia, “Her voice was ever soft, / Gentle, and low, an excellent thing in woman,” and we can almost hear the quiet sounds of the lute strings. WILLIAMS: So, the lute really does symbolize a certain set of cultural ideals, and we also have the practice of lute playing, the accomplishment of lute playing as a real, sort of, idealized courtly accomplishment for young ladies. So, from the time of Henry VII, the lute was the ideal courtly instrument. So, all of his children learned to play the lute, Mary and Margaret, and then Henry VIII made sure that his daughters, Mary and Elizabeth, also were able to play the lute. We have an image of Elizabeth playing the lute by Nicholas Hilliard, which reflects her accomplishments there. So, the lute is an image of courtly accomplishment of power, of empowerment, of skill. And I think that when Ophelia has the lute in her hands, she is able to channel that mastery into her own mastery over her emotions and control over her own performance. GRANT: I want to ask you now about a queen, not a womanly queen like Titania or maybe Gertrude, but effectively a girl queen, Queen Isabella of France, who is Richard II’s wife in that play. Tell us about her. She was quite young when they got married, and this, of course, being a history play, this actually happened. She was a little girl, a very little girl when they got married. Tell us about her. WILLIAMS: Right, absolutely. So, she was Richard II’s second wife. So, he was originally, he was first married to Anne of Bohemia, who was a little bit more age appropriate. And when she died, he was grief-stricken, but needed another wife, and so this young Valois princess Isabella was proposed to him. She was at that point five or six, and she represented a way of getting out of the Hundred Years War and this ongoing war with France. And Richard II had this idea that maybe by the time she was older, his grief would have been, would’ve diminished, so he would be able to, you know, really love her properly. And although it is shocking to us to imagine a girl being married at the age of eight, which she was, in the early modern period and in the medieval period, it was not uncommon for aristocrats and royalty to marry as children to secure and cement various dynastic and international alliances and bonds. GRANT: And there’s some evidence that as she matured, they actually did love one another. They did come to love one another. WILLIAMS: Yes, absolutely. Froissart’s Chronicle makes it very clear that she was behind this match from the beginning. He describes her as saying that she would very much like to be the Great Lady of England, and there’s other historical evidence that demonstrates a real affection between them. Later on, when Richard II was going off to the wars in Ireland, there is documentary evidence of them and their tearful departure. GRANT: What does Shakespeare tell us about Queen Isabella? How was she depicted in the play? Is she a girl or is she a woman? WILLIAMS: Well, it’s interesting that for many centuries Shakespeare scholars have refused to regard this character as a girl. They have viewed her instead as a composite figure, a fictionalized version of the historical truth, that she’s a composite of Anne of Bohemia, and that we should understand the character as an adult. And so, this part is always cast, always played by adult actresses. But it seems to me that the character who is actually often dismissed and overlooked as not very interesting—certainly not the most interesting part of the play—this character comes to life when we imagine her as a 10-year-old child in 1399 facing these struggles and challenges. If you look at this character as a child, all of a sudden we find her speeches incredibly precocious, incredibly wise, and filled with pathos. When she’s just about to hear the bad news about Richard’s fall, she describes “Some unborn sorrow ripe in Fortune’s womb / Is coming towards me.” So, here’s she really imagining herself as a mother, but also the fact that she will never be a mother or she’ll never be the mother to Richard’s child, to Richard’s heir. She’s using this language of womb and of motherhood to describe instead how she’s going to be giving birth not to a child but to sorrow. GRANT: And it’s an actual historical fact that she died in childbirth when she was barely, what, 20, 21 years old? GRANT: Yeah, that’s a tragic life, really. WILLIAMS: Yeah. Her parting from Richard, as it’s represented by Shakespeare, their last scene together, is also extremely heartfelt and poignant. She says to him that she wants him to return her heart; she’s given him her heart and she wants him to return it. She says, “Give me mine own again,” and so while I think that that represents an incredible sense of their connection as Shakespeare understands it, I think it’s also a way of understanding for me how important it is to view this Shakespearean character through the lens of history and through the lens of her historical counterpart to give her back her own, in terms of her own history, which I think has been sadly overlooked. GRANT: Yeah, it’s really interesting. I mean, she’s clearly a woman or a girl of some agency as well. GRANT: Yeah. So, all the girls and characters we’ve been talking about at least in Shakespeare’s time were played by boys, or young men, right? And so it’s interesting to think of how they would’ve portrayed girls without caricature, but as a way of conveying or representing what girlhood was in that culture at the time. I mean, it had to be believable to reflect the appropriate conventions of the time. WILLIAMS: Yes, absolutely. It reminds us, when we think about the fact that these characters are performed all by boy actors, it reminds us that girlhood itself is scripted and constituted through performance. It’s a set of lines, it is costumes, it is forms of behavior, whether we’re talking about in Shakespeare’s time or today. And so, when the boy actors who were performing these roles were performing girlhood, they were participating in a set of cultural codes that were well recognized as what was appropriate behavior for a girl. But of course, this is Shakespeare, and Shakespeare is never happy just to rest on simple understandings of cultural conventions or easy wisdom. So he always complicates things, and he certainly complicates models of girlhood from the very beginning. So these ideals of chastity, of innocence, and of modesty are consistently challenged from the very beginning of his career with girls who are perverse, who resist the expectations that their lovers or their fathers place upon them, and who rigorously define their own identities. GRANT: But it would’ve been completely acceptable and hopefully, at least not on the tragedies or the history plays, never comedic to have boy playing girls. I mean, it would’ve just been that’s what you do. WILLIAMS: That was the convention of the public stage, absolutely. But there were girls on private stages. Girls performed in medieval drama, in mystery plays and miracle plays, and saints’ plays, in the Middle Ages. And in Shakespeare’s time girls performed in civic pageants; they performed in masques at court. And so, there was as well a lived experience of girls’ performance that those boy actors could draw on. GRANT: It’s interesting, too, to think about girl-like and womanlike characteristics that male characters in certain plays would have fretted over having or exhibiting—for example, Macbeth, and the scene where he’s reacting to seeing Banquo’s ghost, and having a hard time of it. WILLIAMS: That’s right, absolutely. So, girlhood is not limited to characters of the female gender in Shakespeare. Shakespeare likes to, in certain cases, imagines his—in the case of Macbeth—highly masculine characters in relationship to girls and girlhood. So, when Macbeth is confronted by the ghost of Banquo he is “unmanned” at this moment—“unmanned in folly.” And he says, “If trembling I inhabit then, protest me / The baby of a girl.” So, if he’s trembling before the ghost of Banquo then described, then he is the baby of a girl, a girl’s doll, or just a baby girl. So, the idea that being unmanned is rendering him some kind of a version of girlhood. GRANT: Wow, "the baby of a girl" is like a superlative of girl? GRANT: And it kind of has me thinking about the women that Shakespeare was drawing on to express the inner lives of girls and women as beautifully as he did. I mean, he had a mother and sisters, and the wives of the other actors he knew, but of course he would’ve probably learned the most from the women who were closest to him: his wife, Anne Hathaway, and his two daughters. WILLIAMS: Yes, Shakespeare did have two daughters, Judith and Susanna, and although he doesn’t seem to have lived with them full-time, they certainly were part of his experience, and part of, I think, his imagination. By the time he’s writing the late plays, at the beginning of the 17th century, his daughters were teenagers, and their relationships with their father as they’re moving into adulthood I think get reworked in the late plays, which are very much concerned with the loss of girlhood and its recovery. GRANT: Ah, that’s so poignant. And, of course, let’s not forget his wife, Anne Hathaway. WILLIAMS: I think you need to remember that Anne Hathaway was six years his senior, and that when they were married, she was already pregnant with their first child. She was someone who had come into some money, and so she had some financial independence. And so their courtship doesn’t seem to have been filtered through the same paradigms of chastity, modesty, girlish vulnerability. It seems to me that he fell in love with a powerful older woman. GRANT: That’s fascinating. And who, of course, a character and that kind of character, of course, comes through in many of his own characters. WILLIAMS: We can see her coming through certainly in Juliet, and in Juliet’s management of the courtship with Romeo, the way that she corrects him, the way that she says, “swear not by the moon,” and then says, well, actually, just swear not at all. The way that she has an agenda, if your "purpose" be "marriage," then let’s move forward. The way that she gives him orders, “Deny thy father and refuse thy name," in fact, making him as perverse and willful as some of Shakespeare’s own girl characters. GRANT: It’s a wonderful thing to speculate about, isn’t it? GRANT: Thank you so much for a great conversation. WILLIAMS: Thank you very much, Neva. WITMORE: Deanne Williams is an associate professor in the department of English at York University in Toronto. Her book Shakespeare and the Performance of Girlhood was published by Palgrave Macmillan in 2014. She was interviewed by Neva Grant. “Why, Here’s a Girl!” was produced by Richard Paul. Garland Scott is the associate producer. It was edited by Gail Kern Paster and Esther Ferington. We had technical help from the News Operations Staff at NPR in Washington, DC.